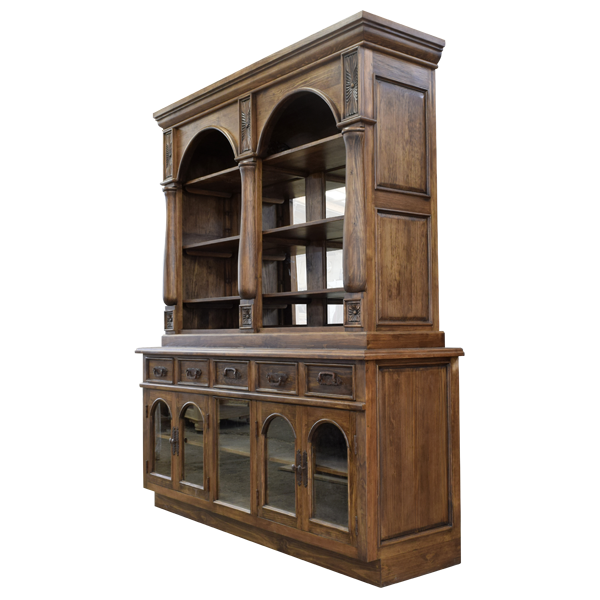 Adorn your formal dining room with the exquisite details on this remarkable, handcrafted buffet. The buffet has a staggered, crown molding, and below the crown molding are two, large, rectangular, open spaces, each with a gorgeous, arched top. The open spaces are divided by a hand turned column, with hand carved details above the capital and also on the base of each column. The open spaces are backed with mirrors and solid wood shelving. 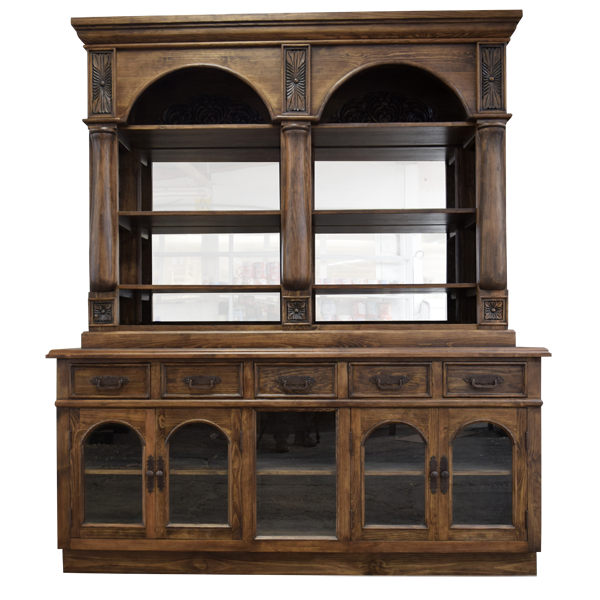 The upper buffet is framed on each side with matching, hand turned columns, each accented with ornate, hand carved, floral details above each capital and also on the base of each column. 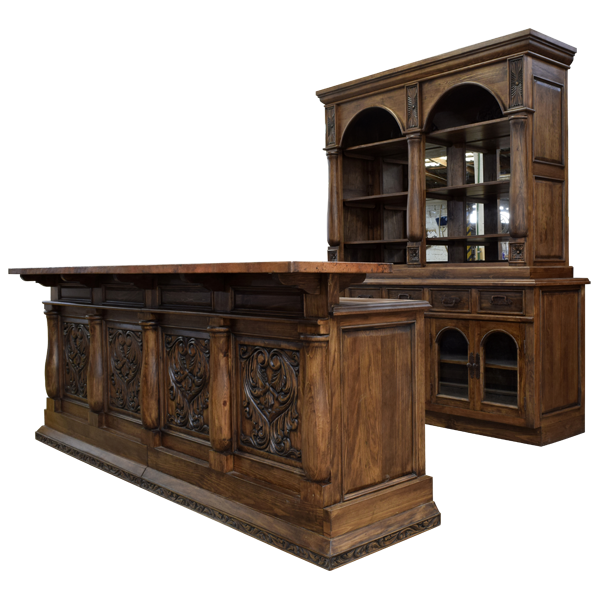 The upper and the lower sections of the buffet are divided by a solid wood, staggered molding. Below the molding are five, horizontal, rectangular drawers, and each door has a hand forged, iron handle in its center. Centered below the drawers is a rectangular space covered with glass, and on each side are two, rectangular doors, each with an arched, glass panel. Each rectangular door has a hand forged, iron handle on its side, and each lower, interior space has a solid wood shelf. The lateral sides have rectangular cut panels, and the buffet rest on a solid wood base. 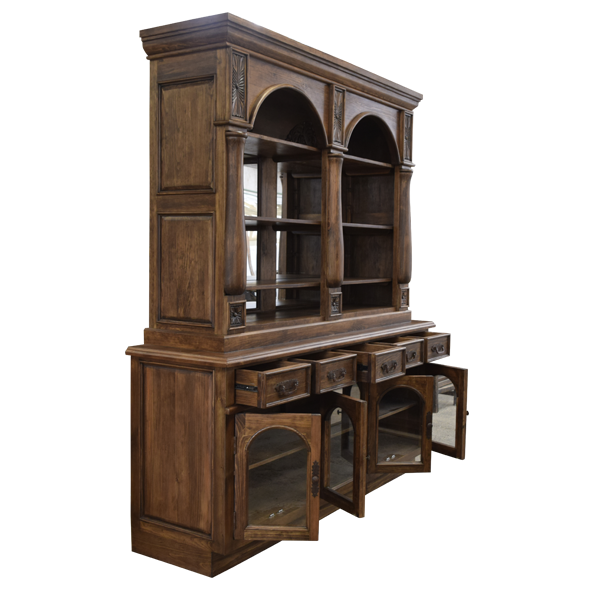 The buffet has a classic finish, and it is made with the best, sustainable, solid wood available. It is 100% customizable.